It was humbling moment for me. It was the first day we gathered outside of the clinic to address all of the people that were waiting for us. We welcomed them and it was amazing to see the amount of people already waiting. I felt really lucky and honored to be there and give my service to them. 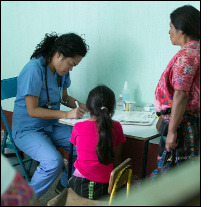 This was my first medical mission, and my first time in Guatemala. Our team with the Global Penicillin Girl project was 27 people strong! We had a dental team, pharmacists and medical doctors. We arrived at Solola, which is a city two and a half hours from Guatemala City. The mission site was another hour away where half of the travel was on dirt road. We helped 14 communities and saw almost 800 people during the 4 days we were there. We set up at an old school building with each department having their own rooms. The people we cared for were very poor and traveled far just to come and see us. Most of the patients only spoke a Mayan dialect called Kiche and we needed translators to help us. This was particularly difficult for me as I am not fluent in Spanish. But after the first day it improved a lot. We saw a lot of common problems such as muscle pain, headaches, and rashes. The medicines we gave out were all donated from the efforts of the pharmacy team. For me it was an amazing experience, one that I will never forget.